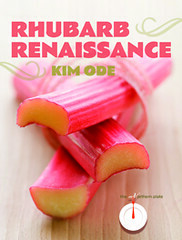 Today’s blog post is a poem by Kim Ode, author of Rhubarb Renaissance. Meet her Wednesday, April 11, at 7:00 p.m. at the Merriam Park Library as part of the Eating, Reading & Living Well program hosted by the Friends of the St. Paul Public Library and sponsored by Mississippi Market. There is a knack to picking rhubarb. Grab too high and you snap the stalk. Like pulling a boot from spring’s muddy gumbo. Given the stern order never to taste them. Onto a wilting mound that grew with every pie. Hoping we had not been trusted too much. I had to try a couple of your recipes but alas, no rhubarb had yet come my way. So for the first time in my life, I actually purchased rhubarb. Your book is good for the economy too!